Papaya is rich in vitamin C and a good source of antioxidants nutrients, fiber and mineral. No wonder, Christopher Columbus said Papaya is “the fruit of angels”. Fiber’s content in papaya is very soft, so that can be consumed by infants or old people. In traditional Chinese medicine, papaya is known to overcome digestive disorders. 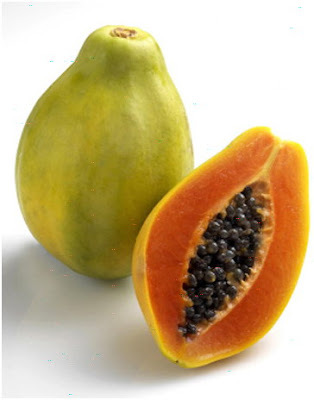 Ripe papaya can be used to cure dysentery, rheumatism, and production mucus problems. There are some suggestions that to prevent lung cancer, colon cancer, breast cancer, and pancreatic disease can be done by consuming vitamin C and carotene, which fortunately found in papaya. Furthermore, vitamin C is very essential on the sperm formation. Lacking of consume vitamin C for men, will inhibit to get children. So, sperm quality and quantity can be increased by adding vitamin C on your food. 1. Blend papaya with orange juice and sugar. 2. Pour into a glass and add the soft drink.